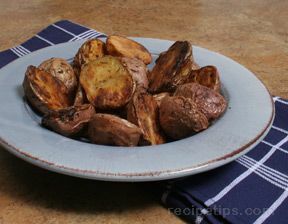 The steaming potatoes prior to roasting helps cook them faster and more evenly. They still get that great crispy skin during the roasting though. Serve them with a little sour cream and ketchup. Wash, scrub and halve red potatoes. 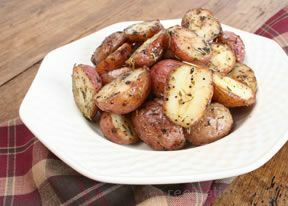 Steam potatoes in a steaming basket in a pot until they are easily pierced with a fork, about 8 minutes. Pour olive oil and seasonings in a large baking pan. 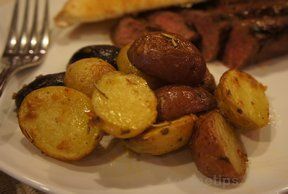 Add steamed potatoes, and gently toss them until they are completely coated with the oil mixture. Bake for 12 minutes in a 450° oven or until the outsides of the potatoes are crusty. Stir potatoes occasionally to bake evenly. 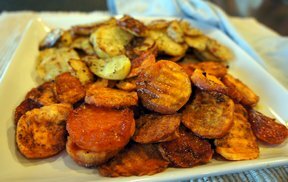 "These turned out great and were done in a lot less time than when I just roast the potatoes in the oven." "I like the idea of steaming before there baked, sounds yummy can't wait to try!"